Light rises in darkness when justice rules our lives. This is the antiphon from our chosen setting of Psalm 112 in Together in Song number 69; it’s a paraphrase based on verse 4. It contains a powerful message – although just what ‘justice’ might mean in our daily lives is open to question. Light shines in the darkness for the upright; the righteous are merciful and full of compassion. 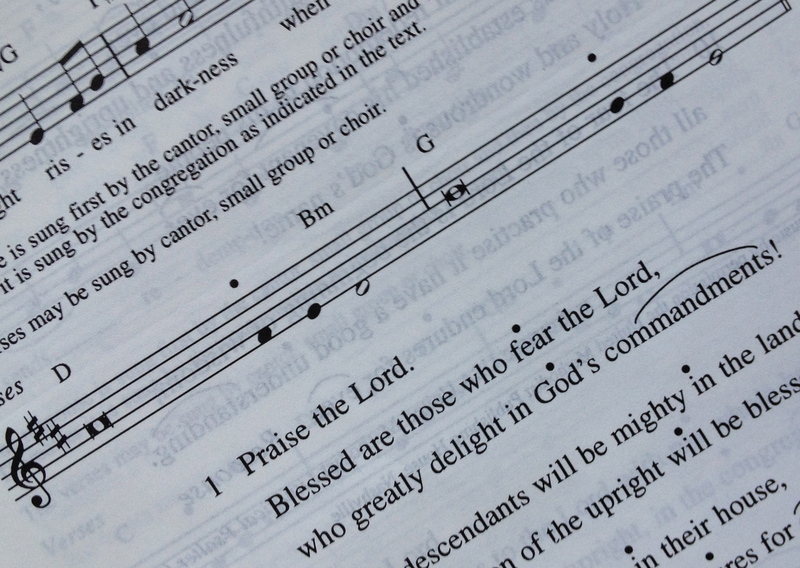 The music for the opening phrase of the response rises step by step, like the sun rising from dark hills, preparing for the final call to a life of justice and faith. A group of women will lead in the singing of this antiphon and, for our consideration and edification, the first nine verses of the psalm. The verses will be sung freely to the tone (a short chant tune with harmony) in the hymn book, with Brian’s delightful guitar accompaniment. The words are not fitted for you into this notation. You remember those few notes of the tune and sing each verse to fit. Here’s the method. Each line of words has a cue marker. The change of notes and harmony is indicated in the text by this cue – a dot, comma or other marker in each line of text, usually before the last three syllables or words which fit the last three notes of the tone. So the rest of the verse or line before that cue all goes into that long first note. It may be a quite long or short phrase or phrases but is all sung on that one note. In Gregorian chant, by the way, they get around this by singing one beat or note value per syllable, with some longer syllables given a double beat from time to time. That can be a bit stiff, however, so in modern usage the cantor or director allows the natural rhythm and meaning of the text to suggest all aspects of the interpretation, running even to a theatrical or dramatic touch if this fits the context of the day.